Though faithful to his pictorial practice, Rafael Canogar has also created sculptures and drawings that follow the same guiding principles animating his painting. Canogar’s oeuvre restlessly oscillates between informal figurative and abstract aesthetics, never wavering from constant experimentation with gestures, matter (wood, polyester and fibre are his materials of choice) and colour. 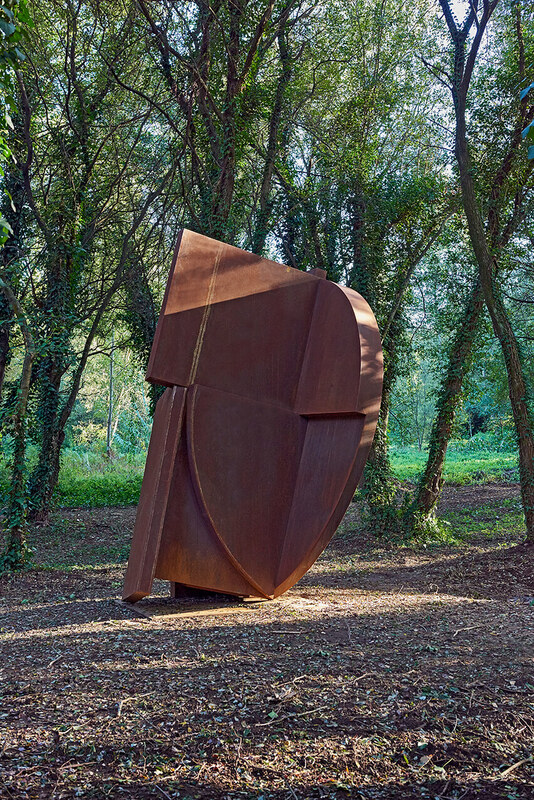 In the piece brought to the 10th Santo Tirso International Symposium of Contemporary Sculpture, some of Canogar’s concerns with the composition and articulation of planes in space have become three-dimensional. In this sculptural transposition, the author gives up painting’s multi-chromatic nature (now limited to the materials’ natural colours), in order to focus on volume and the relationship between geometric planes and structure. Canogar’s oeuvre, including this most recent piece in Santo Tirso, is related to the referential universe of constructivist abstraction through its exploration of dynamic features (brought about by the overabundance of diagonals), fragmented planes, and a myriad of mutually supporting elements which build a universe of rare complexity. Canogar’s free circulation between pictorial and sculptural practices results in the development of strategies gradually permeating both fields.